Prevent hearing loss caused by excessive noise with good quality earmuffs. Foam cushions provide a comfortable fit that's essential especially if you're going to wear it for a long time. Earmuffs with high NRR (Noise Reduction Rating) offer the best protection against noise. These ear protection devices have been tested and proven to meet and exceed ANSI regulation S3.19-1974(Testing Requirements for Ear Protection Devices). Seton offers only earmuffs manufactured and designed by the best in the business. We carry ear protection products from 3M® Peltor®, Howard Leight, Viking®, and Moldex®. Choose from economy to premium earmuffs depending on your work requirements. Get reliable ear protection products only from Seton. Some jobs require workers to be exposed to noise hazards. Workers often face the risk of temporary to permanent hearing loss especially after years on the job. Jackhammers, chainsaws, plane take-offs, industrial machineries, traffic, etc. are just some of the sources of these hazardous noise. Workers need effective ear protection devices like ear muffs to muffle the sound, if not completely eliminate them. If you buy earmuffs, you might notice the NRR number on the label. What's the NRR number for? It's a measurement in decibels that indicate how much noise protection an earmuff or earplug provides. In simple terms, the higher the NRR number, the better protection it provides. Seton carries only the highest quality ear protection products from known and trusted brands. 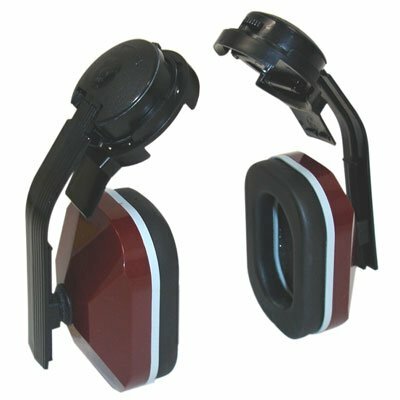 We recommend the Peltor Optime® earmuffs that can be used at the same time with helmets, caps, and other head protection gear. For hot outdoor work, use the Howard Leight Leightning ® Noise-Blocking Earmuff with patented Air Flow Control®. Versatile M2 Multiposition Earmuffs from Modex® can be worn in different ways allowing for other protective head gears. Whatever style of ear muffs you need, Seton will surely deliver.